Here we are again! The Classics are back; bigger and better than ever! This time around I’m taunting you with this crazy awesome cheeseburger. The cheeseburger to end all cheeseburgers. If you remember correctly, the last classic was this insanely good Buttermilk Fried Chicken, and if for some reason you don’t remember, I took the liberty of linking it for you. You can thank me later. I’ve gone ahead and added bacon to the mix because as I’m sure you’ve heard, everything is better with bacon. Just in case you didn’t know, I invented that saying. Okay, maybe I didn’t (but let’s pretend I did). Bacon just takes everything over the edge. You always want to invite bacon to any gathering, it’s basically the life of any and every party. You can quote me on that, although I’m sure you’ve already experienced it for yourself. I know what you must be thinking, “Jonathan, burgers are so SIMPLE to make. Why are you sharing this easy recipe with us? !” Okay, so burgers are easy to make, I’ll give you that. But I’ve actually been told a few times that burgers are somewhat daunting to people. Actual homemade burgers, that is. I think it’s the whole mixing of the meat and shaping of the patties that scares people away. It shouldn’t be frightening at all, though. Not in the slightest. These posts are meant to bring you those classic recipes without all of the complicated steps and hassle of spending hours in the kitchen, remember? So that’s why I’m sharing my favorite cheeseburger recipe with you. Perhaps you’ll even learn a new tip or trick that you didn’t know before. Maybe, it’ll just inspire you to go out and make your favorite burger, that’s okay too. That just means I did my job well, and that’s all that counts. The most important thing is that I’m not ready to let summer go—just for the food, the heat can go away—so I’m still cooking and grilling as if summer is in full swing. Although, it does feel like summer just started over here in Los Angeles. The heat has been insane. I figured why fight it? I might as well embrace it. Hence, burgers in late September. I’m okay with that though because cheeseburgers are everything to me. Especially if they’re mini cheeseburgers. Well, that’s a whole other topic. These? These aren’t mini cheeseburgers, no. But I will tell you what they are. They’re 100% awesome and bigger than life itself, and that’s a fact. We’re going to start by preparing what my mamma would call the most important ingredient in any recipe, and that’s the bacon. She says this to pretty much any recipe that has bacon in it, and even if it doesn’t she’ll say something like, “NO BACON?!?! This should have bacon in it, don’t you think? So anyhow, let’s cook up this bacon. We’re using thick cut bacon and instead of standing over a hot stove getting splattered with bacon grease while we try to cook it all in a tiny skillet, let’s make it easier on ourselves. Cook the bacon in the oven! 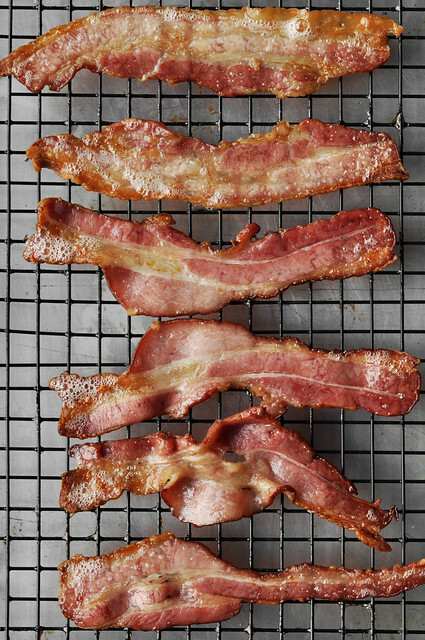 Lay down the strips of bacon, in a single layer, on top of a wire rack set over a baking sheet. Cook in a preheated 375º oven for about 10 to 15 minutes or until brown and crispy, flip the bacon halfway through baking. Once the bacon is crispy and cooked, transfer it to plate lined with paper towels. Allow them to sit there until ready to use so that the paper towels soak up all that excess grease. You can lay a few paper towels on top too, to help soak it up even more. See mamma? I’m being healthy! Let’s now focus on hamburgers themselves. We’re going to use both ground sirloin and ground pork. Season the meat with salt, pepper, granulated garlic, granulated onion, Worcestershire sauce and grated onion. 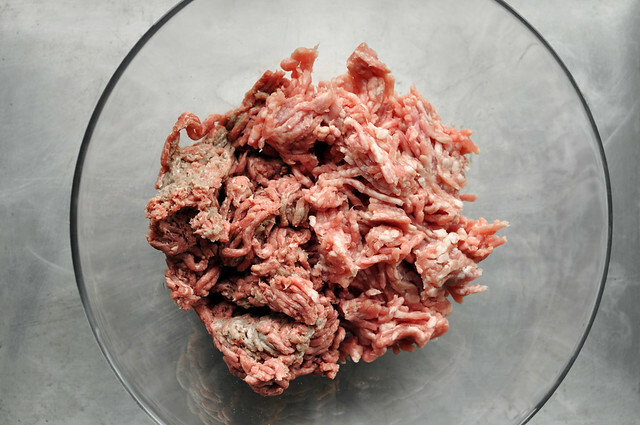 Mix up the meat until well combined, and then divide it into 4 large, even portions. So once you’ve portioned out the meat and you’re satisfied with the fact that they’re all the same size (or relatively close in size) now you can shape and pat them out into patties. Place them on a platter or plate and drizzle with a bit of oil and a tad bit more salt and pepper. Just a tad. Allow those to rest for a bit, while you fire up the grill. In the meantime, let’s make a delicious sauce for our burgers. You know how you go to some restaurants and they have this “top secret” sauce for their burgers. We have In-N-Outs here in California and they’re known for their “secret sauce.” It’s pretty much what makes their burgers so delicious. To me it tastes just like thousand island dressing. 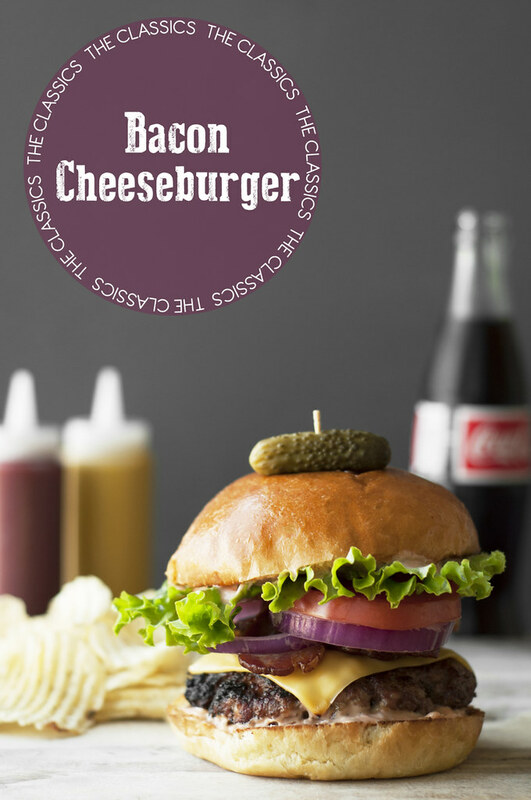 So because this is “The Classics: Bacon Cheeseburger” after all, we definitely do need a secret sauce of our own. Although it won’t be that secret, I assure you. 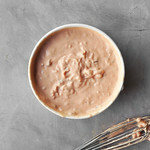 Mix together the mayo, ketchup, sweet pickle relish, grated onion, sugar, white vinegar, garlic powder, onion powder, salt and pepper in a large bowl. Don’t be lazy like me and use whatever bowl you could find, which happened to be a small bowl that made mixing quite difficult. Learn from my mistakes, friends! Use a large bowl. You can give the sauce a taste at this point and prepare yourself to be blown away because it’s deliciously amazing, if I do say so myself. I don’t want to brag but I’m pretty sure we’ve just cracked that secret sauce code. The best part is that it’s not rocket science, it’s super easy to make with ingredients that are easy to find. We can’t beat that. By now your grill should be heated and ready to go. 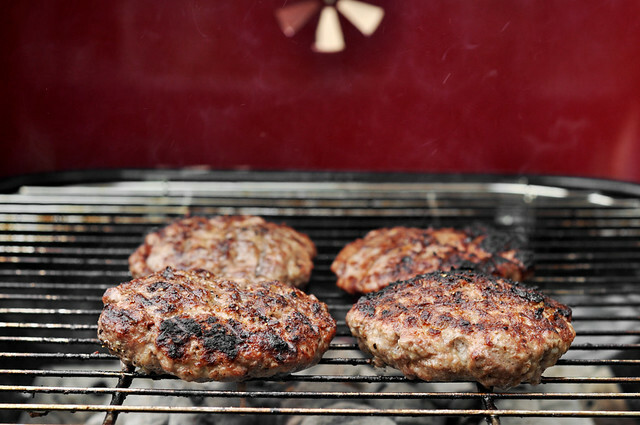 The burgers, at the perfect grilling temperature. Lay them on the hot grill, carefully of course, and cook until charred and crispy on the first side. Flip over and continue to cook until fully cooked through. 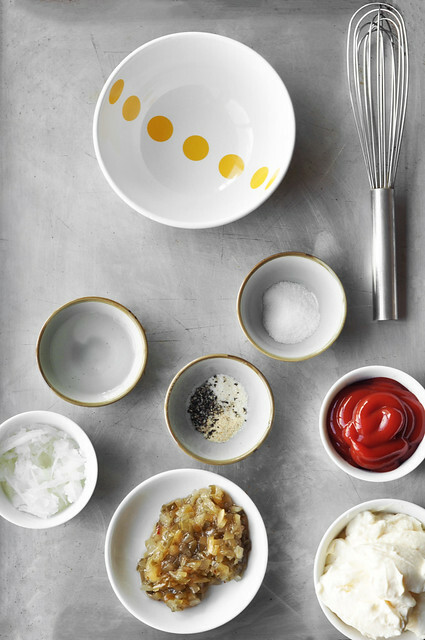 Let’s go over our toppings while the burgers cook. 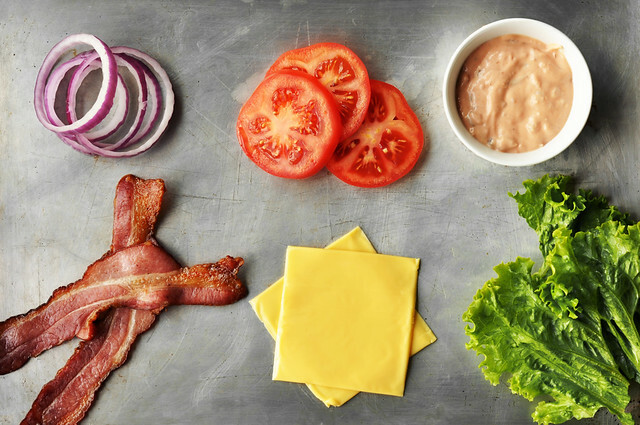 We’re keeping things classically simple with red onion slices, tomato slices, our special sauce, the bacon we cooked earlier, cheese, and green leaf lettuce! 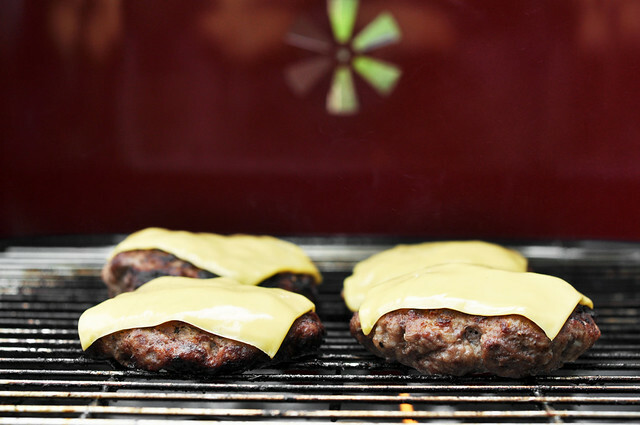 Once the burgers are ready, you can lay down the cheese on each (while on the grill). Let’s turn these simple burgers into simple cheeseburgers. Cover the grill with the lid and allow the cheese to melt. As the cheese melts, you can A). warm up the buns on the grill or B). 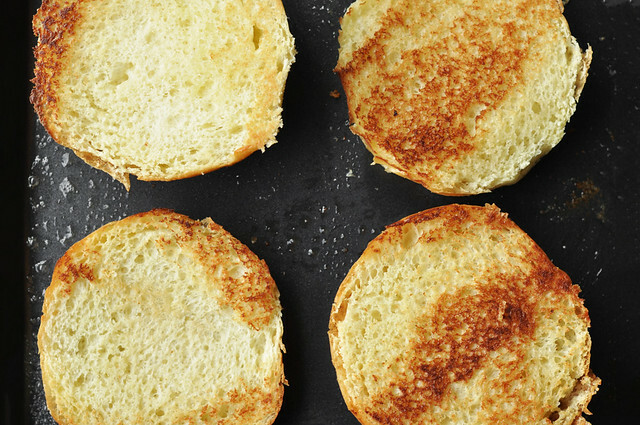 toast them on a buttered griddle. I choose the buttered grill route because BUTTER. 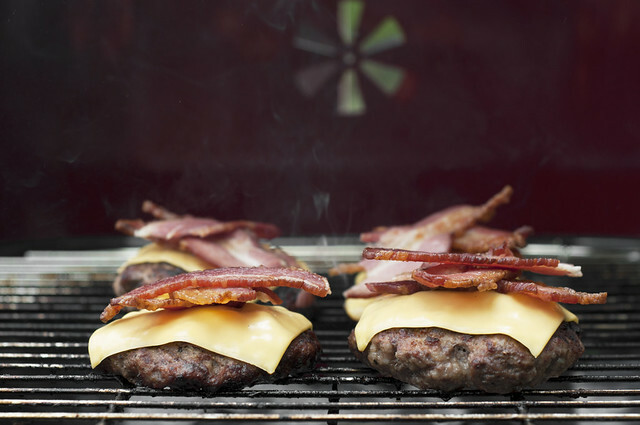 Once the cheese has melted, lay the bacon on top of the burgers and allow it to rewarm slightly. Let’s turn these simple cheeseburgers into simple bacon cheeseburgers. Transfer the bacon/cheese topped patties to a plate, and go assemble them burgers! 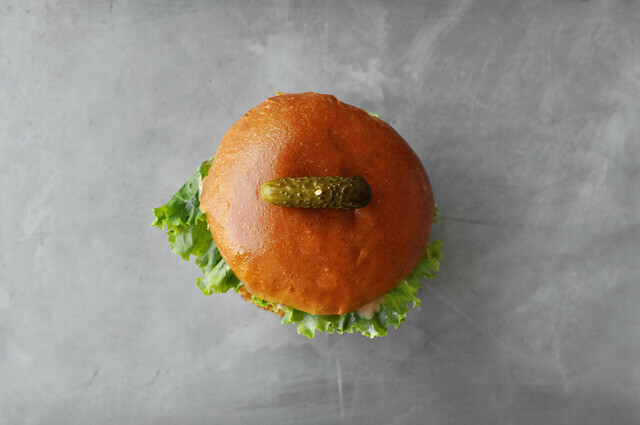 Spread both the top and bottom buns with our special “secret sauce.” Lather it up with as much or as little as you’d like. I hope you drench it, because it’s delicious. Don’t take my word for it, try it for yourself. On the top bun, lay down a lettuce leaf or two, a few slices of red onion and a couple slices of tomato. On the bottom bun, go ahead and place the bacon cheeseburger patty on top! Close up the burger as best you can, it is rather high. Skewer it with a long wooden toothpick with a cornichon attached to it. That’ll help keep everything in place. That’s it. We’re done. Finally. The hardest part was probably firing up the grill, but I’ll tell you what, it was totally worth it. Burgers just taste better to me, when they’re grilled up on a the open charcoal flame. Nothing beats that flavor. 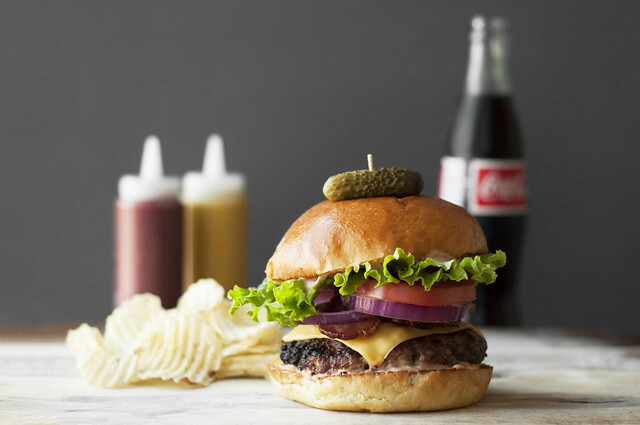 Serve up you burger with potato chips (or fries, if you’re feeling extra brave) and an ice cold soda pop (or beer, if you’re feeling extra good). This is as classic as burgers get, but if you are feeling extra adventurous, by all means throw in some avocado or swap out the cheese for something crazy like blue cheese crumbles, if you’re into that sort of thing. Sautéed mushrooms and spinach would also be tasty! Basically the sky’s the limit. Go crazy and create your own awesome burger. 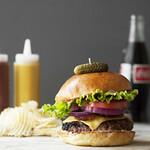 OR just go the classic route and opt out for this classic bacon cheeseburger. Either way, you can never go wrong with a burger. Enjoy! Whenever you make these, don’t forget to tag your photos with #TCAclassics on all social media platforms so I can take a look at them! Can’t wait to see your interpretations of this cheeseburger. And just as a reminder, if you haven’t already, go check out the first installment of this series, The Classics: Buttermilk Fried Chicken! 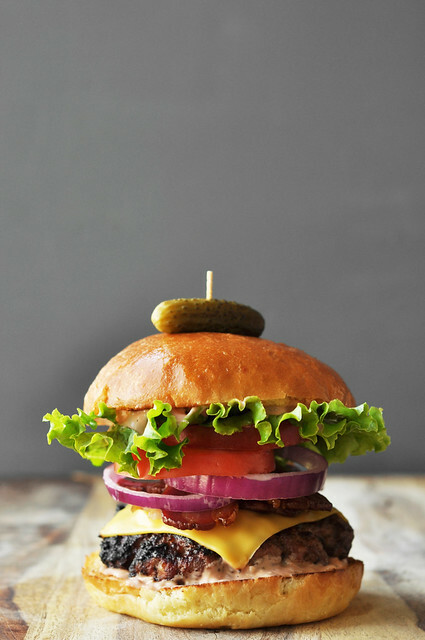 The second installment of "The Classics" brings us this Bacon Cheeseburger. All-American burger made with beef and pork! Loaded with bacon, cheese, lettuce, red onion, and a not-so-secret special sauce! 1. 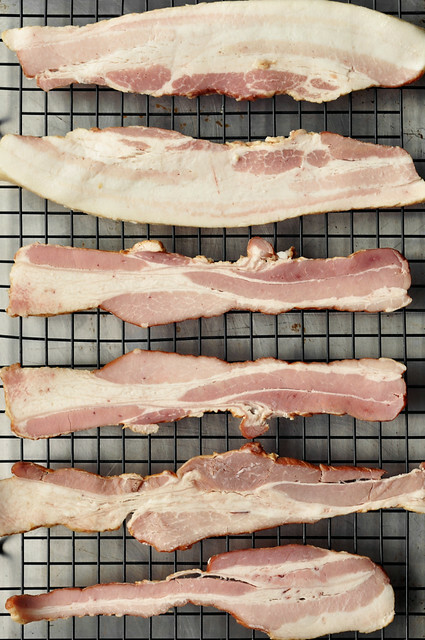 Preheat oven to 375° F. Place a wire rack over a baking sheet and lay down the strips of bacon in a single layer. Bake for about 10 to 15 minutes, flipping halfway, or until crispy. Remove from oven, and transfer to a plate lined with paper towels to drain. Set aside. 2. 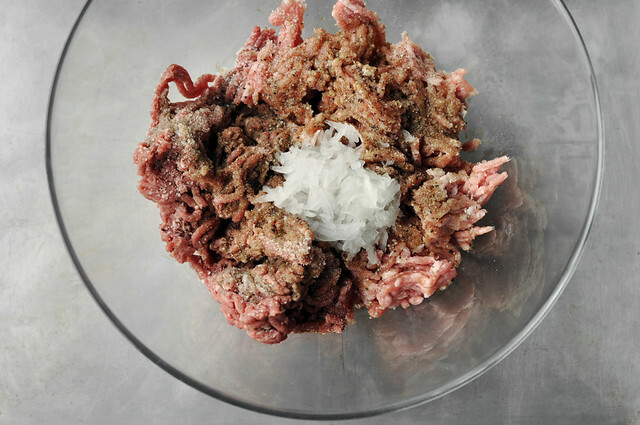 In a large bowl, combine the ground beef, pork, salt, pepper, granulated garlic and onion, Worcestershire, and grated onion. Mix well until evenly combined and portion out into four (or six) even pieces. Pat and shape into round patties. Place on a platter or plate and drizzle with olive oil, and a tad bit more salt and pepper. 3. 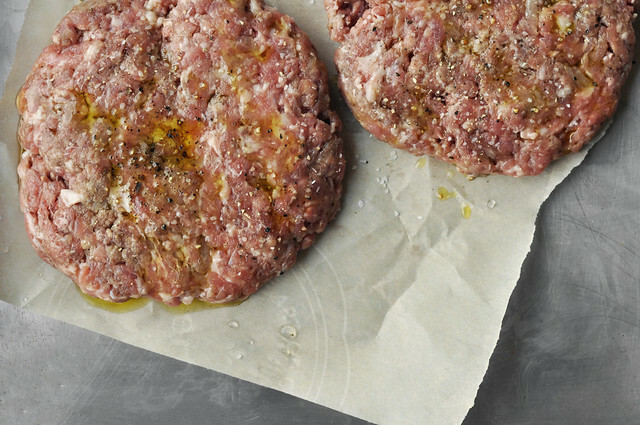 Heat an outdoor grill until hot (or a stove top grill pan over medium-high heat) and cook the burger for about 5 to 6 minutes on the first side. Once charred, flip over and continue to cook for another 3 to 4 minutes on the other side. 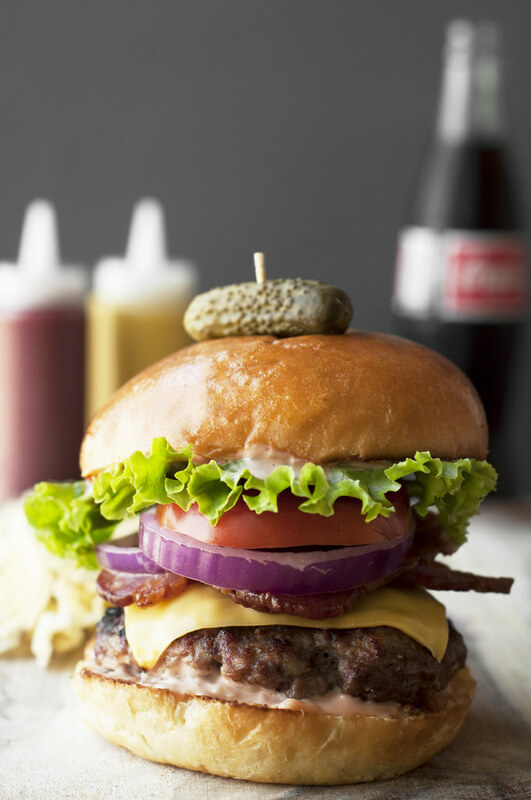 Lay a slice of cheese on each burger, cover and cook until the cheese has melted slightly. 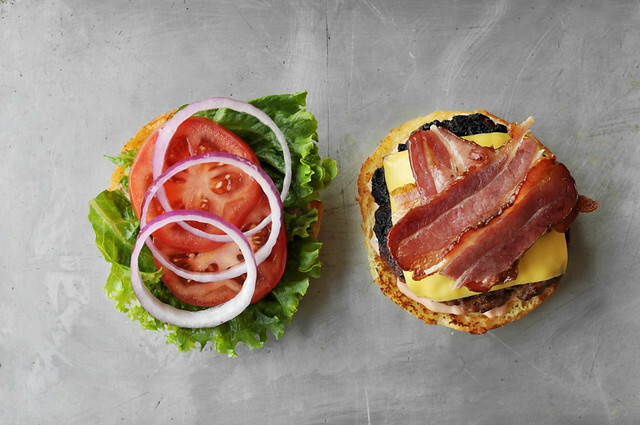 Lay 2 slices of bacon on top of each burger. Transfer to a plate. 4. 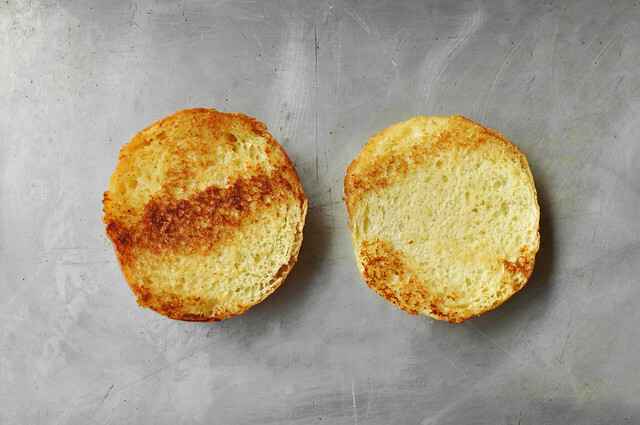 Toast the buns on the hot grill or on a buttered griddle (or skillet) until browned. 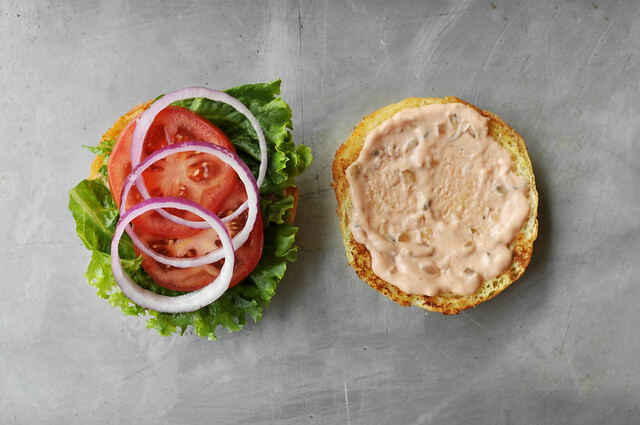 Slather each side with the special burger sauce, and top with the burger, lettuce, red onion, and tomato. Skewer the burger with a long wooden toothpick with a cornichon attached to it. 5. Serve right way with chips, fries or a salad on the side. Enjoy! 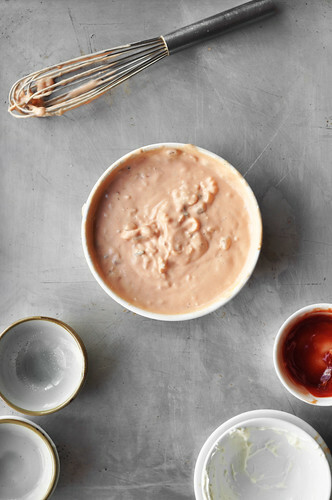 A delicious "Secret" burger sauce that's super easy to make and takes your burgers to the next level. 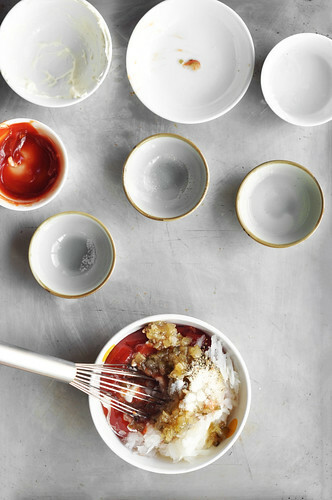 Whisk everything together in a large bowl until evenly combined. Wrap in plastic and store in the fridge until ready to use! Will keep for several days. This is my ultimate dream burger. Totally obsessed with how delicious it looks.. especially that crispy bacon. Pinned and saved to recreate! I’m a sucker for a delicious looking burger! Pinned! That is a stellar looking burger! I just love a good burger. Especially one with crispy bacon and melty cheese.